We all remember the old jokes that always started with the line "What's the difference between a blank and a blank?" Or the reverse, "how is a blank like a blank?" Most of them weren't too funny. The current philosophical (dare I say?) battle isn't that humorous either. After a semi-political exchange in the comment section of a Face Book post by a largely non-political acquaintance the other day, I got to thinking about the differences between Democrats and Republicans. The issue being commented upon isn't important because any other "us vs them" issue would have had a similar ring to it. And since I'm not a Republican and I have no idea if the other commentators are Democrats, it really was just one more discussion about nothing of true importance. Such discussions are getting more frequent than they used to be and they seem to be more about which "side" you are on than anything else. It didn't take me long to remember that the differences between those two political parties weren't as important as the similarities of those groups, so it was a nonstarter. You probably couldn't find a single member of either of those parties that would agree with me on that premise. They have too much emotional energy invested in their "teams" and I'm sure I will come under equal scorn by both. Then I tried for liberals and conservatives. The differences were starker and more numerous, but when it comes to the governance part of those ideologies, they started to run together as well. From my perspective they both are interested in using government power to advance their own particular agenda for the country. (Or for the whole world for that matter.) George W Bush's "compassionate conservatism" agenda is ample evidence for that. As is the Clintonian "moderate liberalism" model. I finally decided that the big differences are between the ideologies of big government "progressives" and freedom minded "classical liberals." 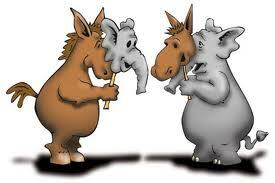 (Today largely known as libertarians) It is in these two belief systems that the differences and the friction lies. I count myself among the latter group so I have a bias when describing the differences. In a short essay such as this just a few of these differences can be counted, but who knows, maybe other essays will follow that describe the many others. First there is the purpose of government itself. One group views it as a necessary means to defend the rights of the people and very little else. Thomas Jefferson and I are among that group. (It's really fun to link myself to 'ole Tom even if you aren't falling for it.) The "progressives" of today think that the purpose of government is to solve societal problems and implement policies which reflect the vision of some angelic elite group who possess superior intellect. Next is taxes to run government. One group thinks the purpose is just that, to run government. To raise revenue. The other group thinks taxes are the best method of promoting "fairness." Another way to describe it is to "spread the wealth" as Barak Obama explained it to Joe the plumber. The same is true of the argument over the spending of tax revenues, so it doesn't deserve it's own category. These things are fundamental to many of us so you may be wondering why I have taken the time to point out the obvious. It's because when both sides of the philosophical aisle start to bicker about whose fault it is when some whack job kills a bunch of innocent people while trying to assassinate a US Representative all of the real differences get lost in the battle between people who largely agree on the big issues even if they don't realize it. To me the differences are obvious even if this list is abbreviated. Can't we all just get along? Interesting artist interpretation. Their shadows look like guns. I didn't even notice but you are right! I hope no nut jobs go on a killing spree soon or I could be accused by liberal talking heads of being guilty of inciting them with this violent imagery. The liberals have had the Democrat Party to represent them for a long time while true conservatives have had no party representing them. (We have no one to blame except ourselves.) The Republicans have been dominated by centrist and liberals. Hopefully things are changing. I just read your article "The Best Place to be Poor". I loved it and would like to reprint it a Conservatives On Fire this Sunday if you have no objections. I'll check back latter to see your answer. Please do. I hope your readers enjoy it.